Sharonda is married and has two children. She is building SJ Wilkes, LLC. Services Center for People with Disabilities, and the business is due to launch January 2011. Sharonda also works at the FMS Treasury in EO/OE as an Administrative Assistant. She enjoys advocating for other disabled adults, singing, shopping, entertaining with family and friends, and fellowshipping with follow church members. 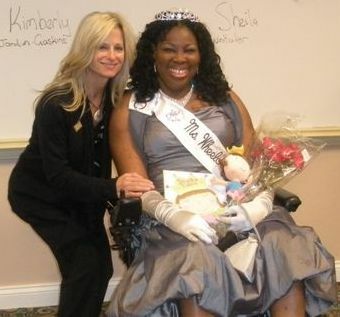 Sharonda was diagnosed with Limb Girdle Muscular Dystrophy in 1995. She has received awards for Volunteering for the Whitman Walker Clinic, Pour Heart’s adult care, and was recognized at their Christmas party for the Non Profit organization (Opening Doors, Inc.) which she founded. Sharonda is a full-time student at UMUC and a part-time student at CSM. Sharonda started a non-profit HIV/Aids Awareness organization (Queens Esteem, Inc.) in 2001, and distributed condoms and literature, and spoke to the general public about HIV/Aids. In 2002 she decided to put the business on hold, enrolled in college, and in 2006 changed the name of the business to Opening Doors, Inc., and during that time began transitioning physically challenged individuals with housing, personal care services, and other resources. She coordinated and hosted fund-raising events, and assisted individuals who were in the process of being placed on the streets from nursing home with housing through Opening Doors, Inc. She incorporated housing into her organization in 2006, after seeing the overwhelming need. After the recession, and other unforeseen circumstances, Opening Doors was closed, and today Sharonda is presently building a Disabled Service Center in Fort Washington, MD, which will provide basic computer training, job readiness skills, resume’ writing, interview skills, job placement, independent personal care services, housing, and transportation, while she is working as a Division of Rehabilitation Services (DORS), and FMS Treasury Summer intern through a new partnership program. Sharonda has also marched (rolled) with the Peace-O-Holics during their “Stop the Violence” march. Hey Sharonda! Congratulations on winning the title of Ms. Wheelchair Maryland!!! Have a great time with it and good luck at nationals! Congratulations Sharonda my sister!!!! I applaud you for being the woman and leader that you are. You are truly a fine example of who we need to represent the disability community at large. You opperate in proffessionalism and I know that the right woman was chosen to do a magnificent work in the body of our community. To whom much is given, much is required and know that wherever, whatever and whenever I can be of service, I will be there. Congrats, we are so proud of your accomplishments!! Keep up the great work. Very proud of you. Continue the fine work that you are doing, it’s really making a difference in lives! Congratulations, Sharonda, on your selection as Ms. Wheelchair Maryland and on all your activities on behalf of those in need! I am proud to be your (volunteer) photographer. Best of luck in this summer in the Ms Wheelchair USA contest. Congratulations Sharonda! You are a wonderful role model! Look forward to meeting you at Silver Spring Disabilities Event.